Beautiful farm located in a unique place where you can enjoy a wonderful view over the valley. The property covers about 40 hectares, where lie the rolling hills covered with olive groves and vineyards and a small lake completely fenced. The property is part of a beautiful property built in 1700 already seal hunting Carlo Ludovico di Borbone, Duke of Lucca and later, the home of Elena Baciocchi, sister of Napoleone Bonaparte. We have 4 houses available, 2 apartments in the central house and two independent cottage. This is to permit and ensure the privacy of guest who want to stay in a typical country estate surrounded by greenery. The surrounding countryside is ideal for walking or cycling. Guest can also quickly reach the picturesque old town of Lucca, the other art cities of Tuscany and the coast of Versilia with its endless sandy beaches. Externally olive groves and vineyards, a garden of about 1000 square meters where you can spend hours of the day and stay in the pool (6m x 12m, depth 1.40m). The pool is equipped with umbrellas and chairs and tables. 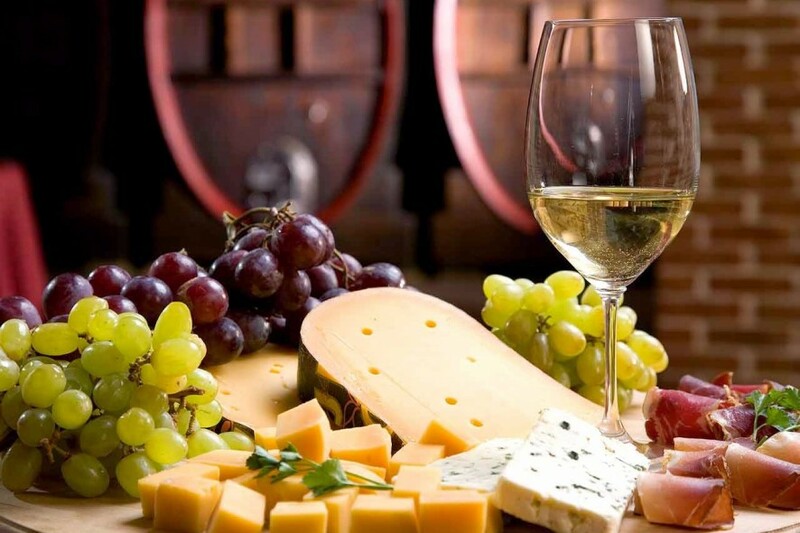 Guests can purchase from the owner olive oil, wine and honey produced on site. Parking in the grounds. Each apartment has an outdoor area to have lunch and dinner. Barbecue and wood oven pizza are available to customers. There is a room with washing machine, iron and sink available to all customers. 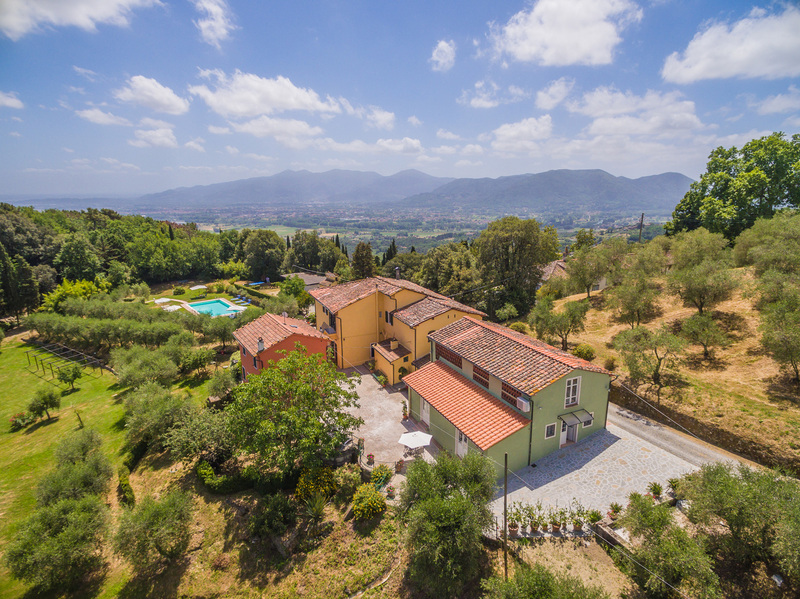 This beautiful farm is situated in a unique place, with a splendid view over the valley, from which on a clear day you can see Lucca and its wall. The property covers about 40 acres, with rolling hills covered with olive groves and vineyards and a small lake. Guests will enjoy a swimming pool (6×12 m, 1.40 m deep), surrounded by a lawn (about 1000 sqm), partially fenced and equipped with tables, chairs and sun umbrellas. The surrounding countryside is ideal for walking or cycling. Customers can also quickly reach the historical center of Lucca, the other art cities of Tuscany and the coast of the Versilia with its endless sandy beaches. 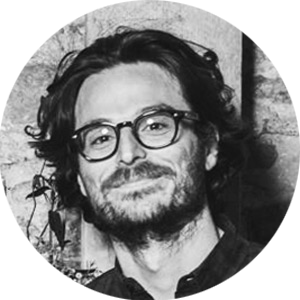 Surf and bike cross lover, Giacomo will tells you all on the best surf spots in the neighborhood. He loves good food! No surprise she's the right person to ask for information on nice restaurants and pubs. 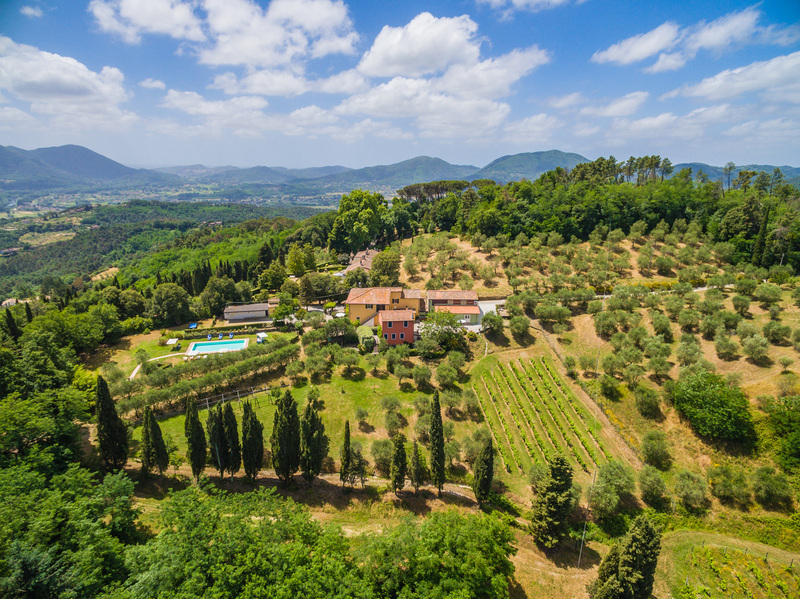 Nestled on a hill overlooking the walled city of Lucca and Tuscany up a winding county road, this fantastic property offers the peace of the county with easy access to tourist attractions, restarants, shopping, and nearby towns...but you may never want to leave! Inside a working olive grove and vineyard, the three properties are all comfortably furnished and include great kitchens and outdoor patios and grills. The pool is perfect. and right outside your door. Everything is exceptionally clean and well kept. 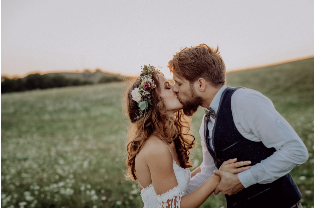 The owners and staff are friendly and helpful at all times, and go beyond duty to make your stay a pleasant and relaxing one and to make you feel completely at home. There is no pretension, and you will feel comfortable letting your kids be KIDS and play, relax, swim and explore. The 40 acre property is fantastic for quiet evening walks and views of romantic vistas. 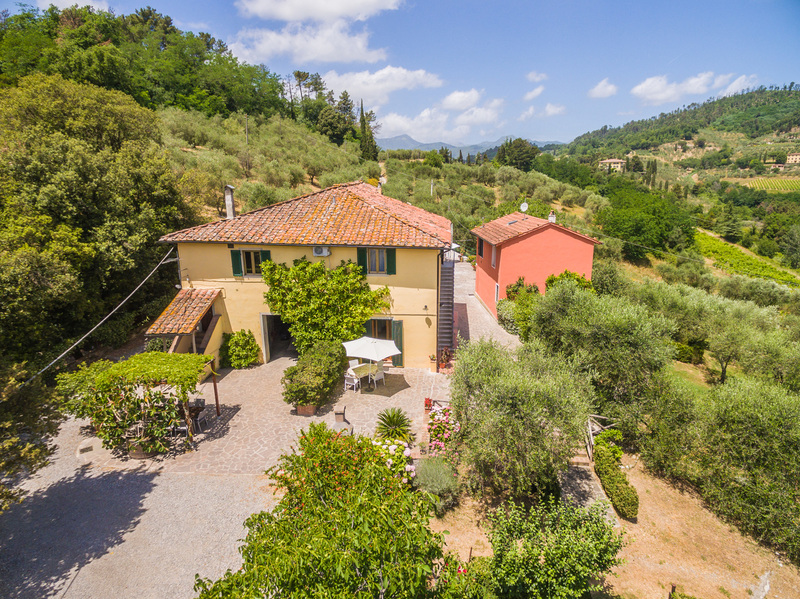 A stay on this property with visits to the area will leave you thinking that Tuscany is just as beautiful, the people just as friendly, the food just as wonderful, and your vacation just as memorable as you could ever have hoped it would be. 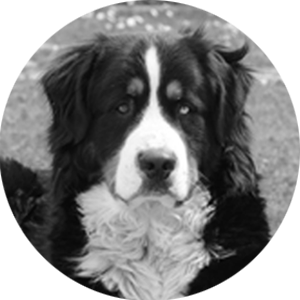 A rental car is a must for this property, as you are nestled in the hills a short ten minutes or so above Lucca. Because the estate is so close to Lucca, it is easy to discover Toscany; within 10 minutes you are on the main road to Pisa, Florence or Viareggio. Handy! Late in the evening, driving back to the cottage, you can meet foxes, swines and owls. So, great area, great location, great cottage!! Well worth visiting. A beautiful place with lot of space and everything was in order. A perfect place for self-catering. You need a car to drive around, but it takes just a short time to drive to the center of Lucca, and there the whole family can enjoy shopping and just look around this city, who has a lot of qualities. 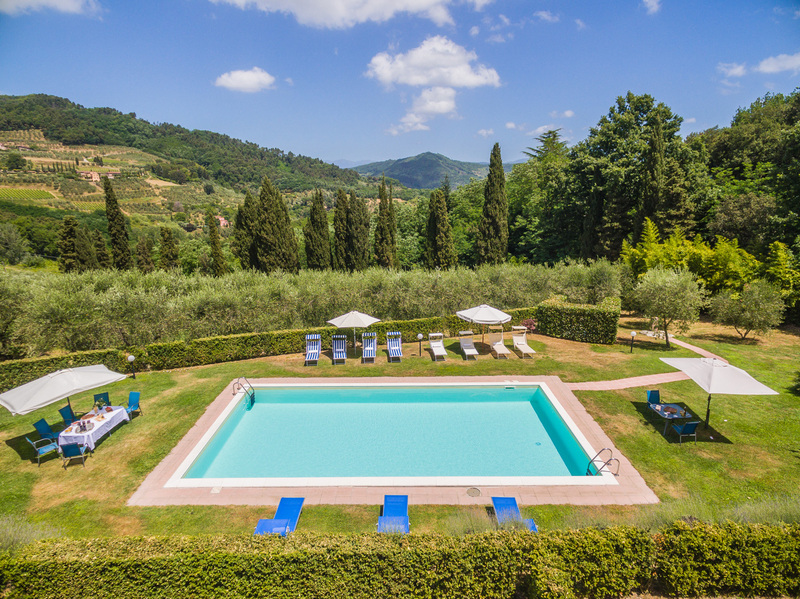 After a day in Lucca or another destination in Tuscany you can swim around and cool yourself in the pool with a cold beer, before preparing and evening out or making a cosy dinner all for yourself. We enjoyed our stay very much and would love to have the opportunity to visit another time with friends of us. Every third weekend of the month Antique Market , in the square and downtown streets. All last weekend of the month Historical Arts and Crafts Market, Piazza S. Giusto and the neighboring area. February / March Carnival of Viareggio, famous around the world: four Sundays in fancy dress along the walk of Viareggio. April Biennal of Azalea in Borgo a Mozzano and Show Flower Market St. Zita – In Piazza S. Frediano and Piazza Anfiteatro you can see this explosion of colors and scents. May / October in Festival at the weekend, theater, music, ballet in historical homes, churches and beautiful environments in the Plain of Lucca. June / July ‘Summer Festival’ series of concerts in the most beautiful square of Lucca with international artists. ‘Puccini Festival’ in the splendid setting of Torre del Lago Puccini for Giacomo Puccini. Tenuta Bellosguardo is one of the best places where to relax and renew the contact with Nature. 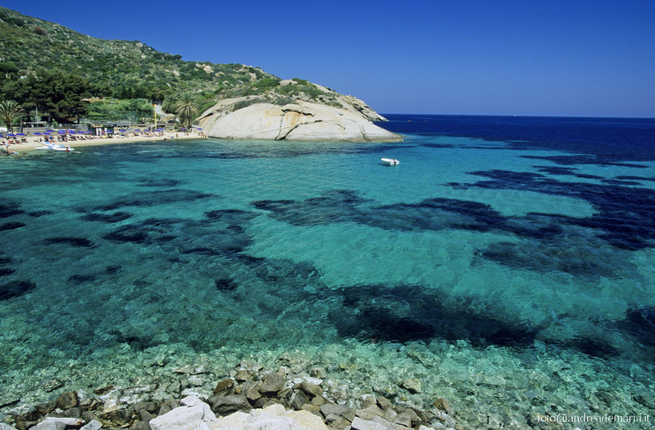 A quiet, yet lively place worth visiting!